Since 1956, Social Security Disability Insurance (SSDI) has been an effective social insurance program that helps individuals whose physical or mental disabilities are so severe that they cannot do substantial work. The inability to work, along with disability-related expenses, can make meeting basic financial needs nearly impossible. By keeping this program strong for people who have paid into the system, it prevents serious burdens such as homelessness brought on by foreclosures, evictions and bankruptcies. 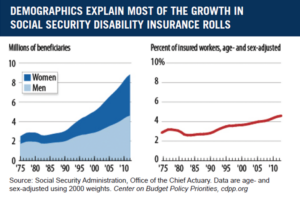 Demographics explain the recent expected growth in Social Security disability insurance rolls. While the growth in the number of people receiving SSDI was expected, it is leveling off. What explains the growth in recent years? BABY BOOMERS: aging and reaching “high disability years.” People are twice as likely to be disabled at age 50 as they are at age 40 and twice as likely to be disabled at age 60 as they are at age 50. WOMEN: increasing numbers of women in the workforce in recent decades who are now themselves eligible for benefits. RAISED RETIREMENT AGE: as the Social Security retirement age rises, disabled workers receive SSDI for longer before converting to retirement benefits. A strong disability insurance program is vital to the economic security of American workers and their families. Achieving long-term solvency for our nation’s Social Security system should be a national priority. Reallocating payroll taxes — as has been done nearly a dozen times, equally in both directions — to replenish the Disability trust fund will make put both funds on sound footing. Thereafter, a number of policy options exist to ensure long-term solvency of the whole Social Security system for current and future generations. The Center for Budget & Policy Priorities is an excellent resource for up-to date information and data about the programs.